Our house is a cosy chalet on the countryside with a large garden and uncountable opportunities to design your individual holiday. The house has three floors and offers several special amenities like a sauna, a fireplace as well as a winter garden for the colder days. It offers 6 sleeps at a maximum in two separate bedrooms. The kitchen, as well as the bathroom and separate toilet are fully equipped and very clean. The kitchen has a adjoining living room with a large wooden table for many delicious dinners. 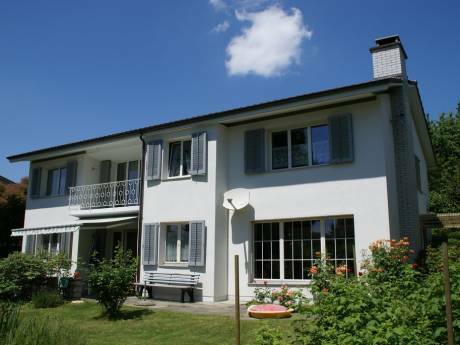 The house is wooden and quite old but very charming and the perfect place to stay as you can enjoy the rural calmness and at the same time reach the capital of Switzerland (Berne) in a 15 minutes drive. We are young couple and both study in Berne. While Jan (male!) learns much about economics, Michelle rather spends her time with the education of future generations. The concept of home-swapping is new to us but a perfect opportunity as we inherited this cute chalet and love to travel. Our intentions are to get to know new cultures and to spend our long summer and winter semester break in a new and preferably warm and sunny country. We would love to stay close to the sea. Our neighbourhood is very quiet and safe. The house belongs to a hamlet which is about a twenty-minutes walk from the next village. Therefore, the neighbourhood is very rural and nesteled in the middle of vast meadows and large forests. This place is perfect to calm down, relax and unwind but it as well offers numerous possibilities and activities. You can find many shopping facilities in a five-minutes drive and a famous restaurant just across the street. 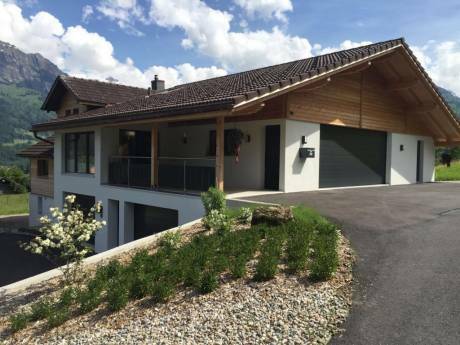 As our home is located quite in the middle of Switzerland, you may reach Zurich and Geneva in one and a half hours as well as several lakes and the mountains for skiing in a even shorter drive. A large shopping mall, including a water park with many slides, several large pools and hot tubs, as well as large cineam is only 15 km away. Berne has many cultural offerings, a lovely historic township (with the famous "Bärengraben") and a big train-station with access to many international train connections. We would provide a private parking space at the train station in Berne.